Available for in store purchase only. 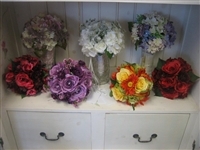 Selections and styles vary as bouquets are made as one-of-a-kind pieces. Please call us and we will be happy to help you select a design you love!